There’s a man seated on an empty ledge in the inner city of Johannesburg, he’s a black man, next to him, his friend or colleague, a white man, they having heated debate. In front of them, a woman. She stands resolute, one arm raised, holding firmly, a bottle with a burning wick. She’s carrying a baby on her back too, bound by a blanket. She’s a mother, a fighter, a leader. Her right arm raised higher, holding a statement demanding for all of the city to read “Democracy is Dialogue”. She is bold and bronze monument, a symbol of the South African liberation. Behind her, the words “Libri Thesaurus Anmi” (Books are the treasure house of the mind) are etched into the stone of a building, the Johannesburg City Library, another symbol of South Africa’s democracy. GRAND DESIGN: The Reference Library is a vast space to explore, holding a range of texts from historical records, to practical handbooks, scientific treaties, literature and contemporary knowledge. The librarian’s desk is long, but the library itself is grand in design. White spherical globes hang from the carved and coffered Italianesque ceilings, while young and old adults indulge in knowledge below. In the Beyers Naude Square of the Johannesburg inner city, you can see people from all walks of life. A skater passes a homeless man, while a girl and her friend in their school uniforms walk up the 21 steps towards the grand and intricately designed doors of the Johannesburg City Library. As you enter, a young man behind a counter is the first to welcome you. The lighting is dull and insufficient. The pace is slow, a contrast to the buzzing outside. People inside are either filling their water bottles from the water cooler, looking down from the balcony on the first floor or walking slowly into a section of the library to start studying. It’s exam period, the library has more activity than usual. The man behind the counter waits to receive your belongings and issues you a worn out card with a number marked on it. While you wait there’s a squeaking escalator on the left, that’s hard not to miss but also easy to get used to. 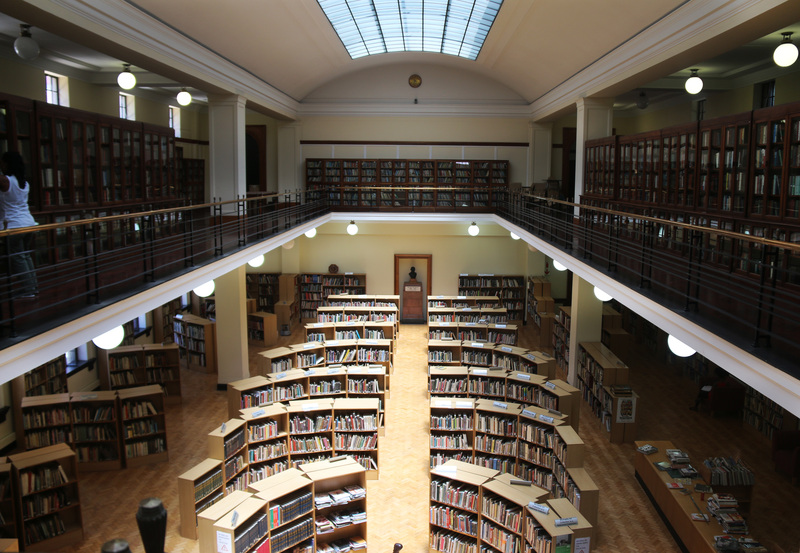 The Johannesburg City Library (JCL) was opened to all races in 1974, in an attempt to overcome the spatial divide between races. Over time it became a symbol of knowledge, transformation and democracy. Taking us on a backward journey Des Patel, who worked as a librarian in the 80s, said the library was commonly used recreationally for children and adults. “People would go there to read for pleasure,” she said. Despite being open to all races, Patel said sections of the library were still very racially segregated, the facilities were used differently. Through knowledge it was possible for young activists and leaders to inform themselves on the liberation and find ways to transform their society. Two decades later and living in Johannesburg, in a so-called “new South Africa”, sees many people grappling with the idea of being truly African. The library, located on Albertina Sisulu Road and Pixley Ka Isaka Seme Street, is quite ‘underutilised’, said Patel. Edgar Serala, 32, a tall and lean man sits in his chair in the Michaelis Art collection on the second floor. Surrounded with books and art pieces while natural light streams in from the windows in the ceiling, Serala looks around with familiarity before he starts talking. Serala comes from Soweto and has been a library user ever since he was a young boy. He is a school drop-out but has not allowed that to detour his path. He is an aspiring writer, former miner and now an entrepreneur, who frequents the library to improve his business in Soweto. He is a self-taught man and uses the library as his ‘virtual’ office. “It’s easier and cheaper, I meet clients here, use the wi-fi to develop my own website and do the digital marketing for my product,” said Serala. He believes that despite the library being a hoarder of knowledge, it needs more. “This is more of an academic library, it houses more 20th century material,” he said. He says to some extent the library does not identify with the majority of South Africans. “It still has that colonial structure and it houses that material – we need to ask – do we actually know enough to transform our society, maybe the library needs to transform, before we can transform our society,” he said. “We don’t only reject it, but it rejects us,” he added. The architecture and buildings around town are still very European and it does not fit in with the identities or understandings of the African majority. “We’re not necessarily doing away with Eurocentric thinking and material, it’s about giving us the opportunity to learn more about Africa,” he said. Serala enthusiastically made reference to Black-Consciousness leader Stephen Bantu Biko’s I write what I like. “I read it when I was young, but it ‘fucked me up’, it made me analyse everything, I didn’t realise what was going on around me and it opened my eyes to the potential of transformation – imagine if I had access to more books like that?” he said. For Serala, in order to transform, there needs to be a transformation of knowledge which allows people to see and discover things for themselves about the world. In the same space, also comforted by the knowledge on Art and Art history in the Michaelis Art Collection on the second floor, is librarian William Stewart. 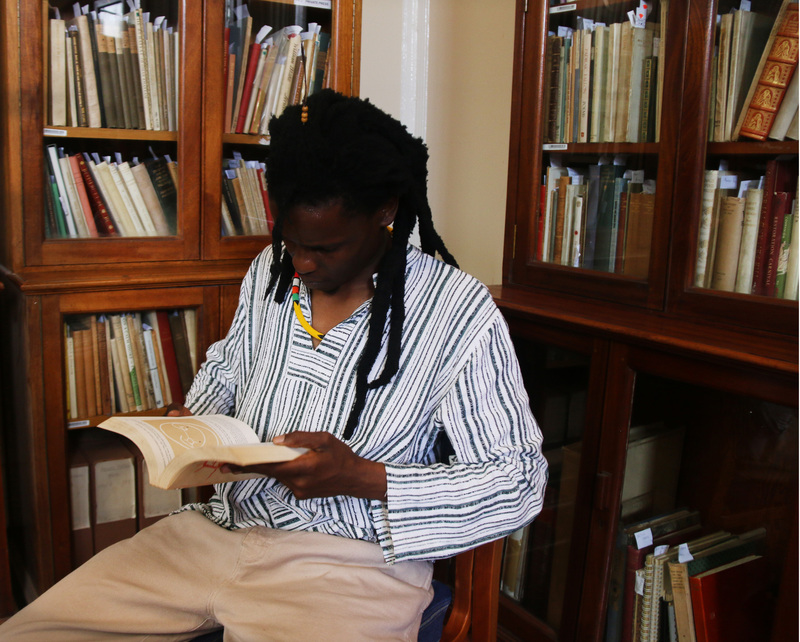 Sitting by a round desk, Stewart said the JCL is a preserve of the wealthiest collections of knowledge about South Africa’s history. 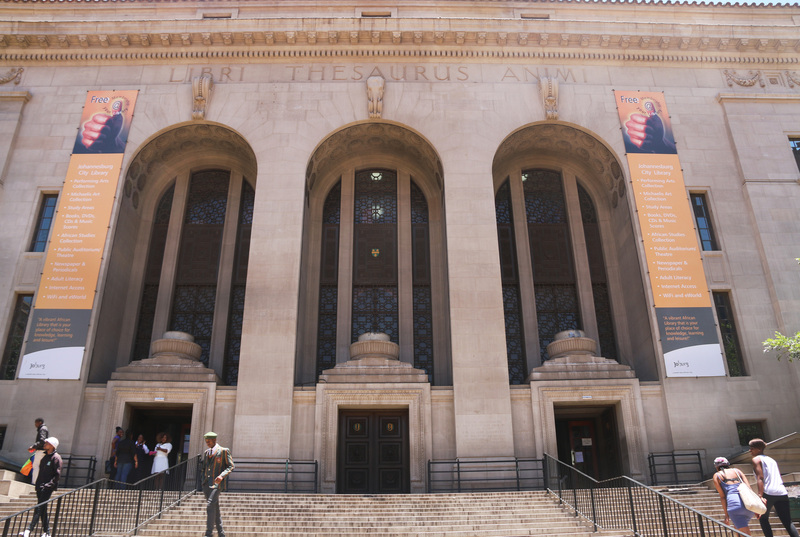 “During apartheid, there was a ban on certain books, a kind of censorship and librarians had to burn these books,” but Stewart, who has been at the JCL since 1991, said the librarians at the JCL could not bring themselves to burn books or records they kept of the city, they instead hid them, and when the ban on these books lifted, the books resurfaced. 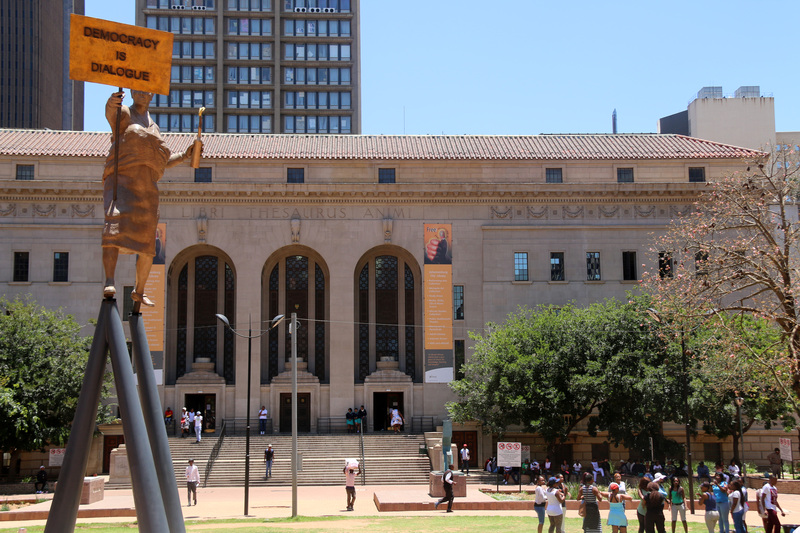 He said the Johannesburg Library, as it operates today, contains books that represent all points of views. This, he said, is so that people who use the library can make their own informed decisions about the country’s politics and social issues. 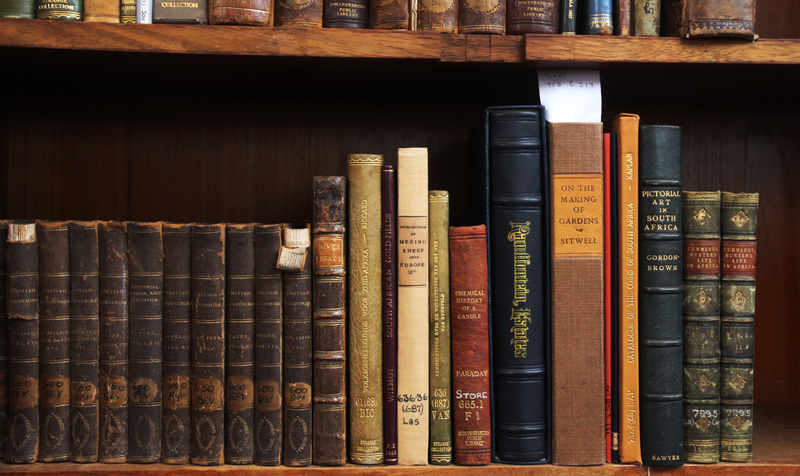 “The library’s role is to collect and preserve information of local interest,” said Stewart, while adjusting his thick black-framed spectacles. The Michaelis Art Collection houses the ideas of contemporary artists from Africa and Europe, either on the shelves or as pieces framed against the walls. A colourful but crammed piece by South African artist Helen Sebidi ushers you into the library. Sebidi is a common name among South Africa’s township artists. Her art confronts themes relating to the ‘dislocation and disruption of society’. She drew her inspiration from the happenings and experiences of daily township life during apartheid. Stewart, who commended the library’s wealth of knowledge in art, history, archives, music while also embracing the use of the internet to supplement knowledge, said libraries collect knowledge for the benefit of society, to broaden people’s perspectives and add to their knowledge of the entire world, not just their own continent. Through whichever means, the library embodies engagement with knowledge. Every fortnight, the Indaba room on the first floor is brought to life through conversation. People with a disparity in age and background gather around rectangular tables to discuss books they’ve read and provide personal perspectives on current affairs. Rethabile Dladla, who frequents the dynamic space, said these discussions inform her on broader issues about the world without having to read the news. “It’s about learning through conversation – people talk about what they learn and we share,” she said. The 23-year-old journalism student from Boston College in Johannesburg said it is a free space and people of all different ages talk about whatever they want. The value and significance of the library holding discussions during the information age is relatively rare. Many overlook that knowledge can also be obtained through conversation and by challenging views, as they do in the Indaba room on the first floor. Recreational reading is seen as rather rare according to former JCL librarian Shamim Hargovan. She recalls the vibrancy of people who used libraries in 1984 when she worked there. “It was vibrant and busy and now there is no reading youth,” she said. Libraries in these circumstances have the responsibility to facilitate and make provision for learning and knowledge that is accessible to all. Public libraries are somewhat representative of an informal schooling system, educating on issues that go beyond their own benefit and interests. Trailing across the open space from the Michaelis Art Collection, towards the left wing staircase, many youth can be seen gathered around tables with white lights reflecting off their faces. Unlike the natural light streaming in through the windows on the ceilings, this light instead comes from the light of smartphone or laptops. The marble stairs on the left leading up to the Africana section are well lit compared to the rest of the library. Almost like a metaphor for enlightenment of the African child, seeking to quench a thirst for knowledge in a building that looks like it’s been pulled straight out off the page of an Italian architecture book. More glass casings, to protect the history or to protect the people against the history. There are rows of cabinets, glass and wooden cabinets, holding the books that carry South Africa’s history. Pre-democracy and even the times before that. History in books is peculiar. They capture the details and ideas of intellectuals, until someone cares to pick it up, page through it and absorb the ideas for intellectual enlightenment. A definite product of African knowledge is Gugulethu Bodibe, a writer and researcher. He can be found sitting on the cushioned chair, in front of a wooden table, stacked with various political books, reading one of his own. A loose crocheted beanie and a Zulu beaded chain to dress his neck. He uses the fan to cool him in the stuffy preserve of the Harold Strange Africana collection on the third floor. Bodibe has invested his time in the study of African history, culture, spirituality and politics and published an article called “Culture as a weapon” in an American magazine in 2009. Since then, he has turned his research towards the understanding of Ancient African history and language. Bodibe developed a keen interest in Ancient African languages and how they can be used to advance African knowledge systems. He drew his inspiration on this subject from Kenyan author Ngugi Wa Thiongo’s book, Decolonising the Mind, which discusses how African authors have to write in African languages. “I armed myself with that knowledge and applied myself practically,” he said. Bodibe started a company called Setheo Seshat Djehuty (the Institute for the Manifestation of Wisdom) that aims to promote the study of African languages and literature in South Africa.